Mothers and their children in a queue waiting to receive measles vaccinations as part of a UNICEF-supported immunization campaign at the Beerta Muuri camp for internally displaced persons in Baidoa, Somalia (file). “It is a priority for WHO [World Health Organization] to continue supporting the Ministry of Health and maintaining the close partnership with the local health authorities and partners to control disease outbreaks like measles and ensure high vaccination coverage for all Somali children,” said Dr. Ghulam Popal, WHO Representative to Somalia. “It is unfortunate that measles cases are still being reported while there is effective vaccine available,” he added. The campaign was conducted in partnership with WHO, the UN Children's Fund (UNICEF) and Somalia's Ministry of Health. In 2017, amidst a drought emergency, a total of 23,002 suspected measles cases were reported – alarmingly high compared to previous years. Among those cases, 83 per cent were in children under age 10. 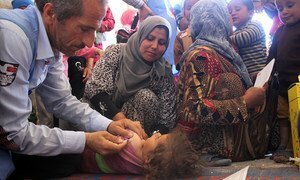 In response to the outbreak, two rounds of vaccination campaigns were conducted in March and April of 2017, reaching 516,934 children aged nine months to five years. “Together with our partners, UNICEF was able to achieve great results for children and families affected by drought in 2017,” says Jesper Moller, UNICEF's acting Representative. During the campaign, a support dose of Vitamin A will be administered to eligible children alongside the measles vaccine. Social mobilizers and health workers supported by WHO and UNICEF are also encouraging adults who are not fully immunized, or not sure of their immunity status, to get vaccinated as well. “The only way to protect children from this deadly disease is through mass vaccination campaigns. And we will remain vigilant and sustain our emergency efforts in 2018,” Mr. Moller concluded. Measles is a highly contagious viral disease that is transmitted via droplets from the nose, mouth or throat of infected persons. Routine vaccination for children, combined with mass immunization campaigns in countries with low routine coverage, are key public health strategies to reduce global measles deaths, says WHO. Globally, nearly 13 million infants – almost one in ten – did not receive any vaccinations last year, putting them at serious risk of potentially fatal diseases, the United Nations Children’s Fund (UNICEF) and the World Health Organization (WHO) said today, urging greater efforts to extend the reach of health services.